5.6 Earthquake hits western Sichuan, China. 5.3 Earthquake hits northern Colombia. 5.3 Earthquake hits Tristan de Cunha. Melting ice is a major problem because of its contribution to sea level rise, but it also affects wildlife in all kinds of ways. 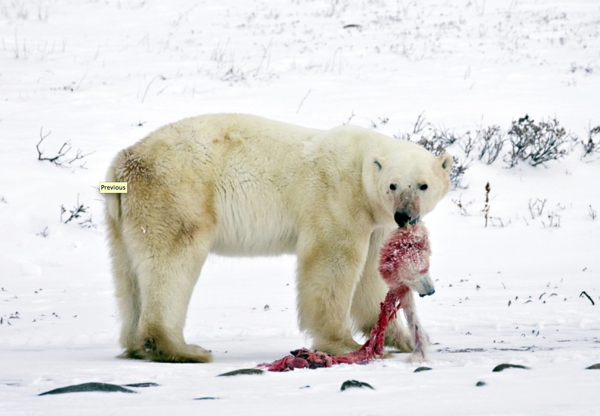 As their frozen hunting grounds melt away, some polar bears — like this one — are turning to cannibalism and eating their own cubs. Fogo (Cape Verde): The eruption continues, but the situation is critical inside the Cha caldera. The northern lava flow branch has started to enter the village of Portela and today destroyed and/or damaged several buildings, including the headquarters of the Fogo Nature Park. The village, located at the northern end of the main road inside the caldera, is at risk of being cut of by lava flows: If the main road becomes covered, only a difficult and long passage to the NE via Monte Velha remains as land evacuation route. Aso (Kyushu): Activity from the Nakadake crater has intensified. Since yesterday, ash emissions and comparably strong incandescence have been observed, suggesting that a new magmatic eruption could be under way. The height of the emitted ash plumes was up to 8,000 ft (2.4 km) and light ash fall was reported from Namino village 11 km NE of the Nakadake cone. The volcano had been showing signs of unrest since 2013, with intermittent small, probably phreatic explosions and weak to moderate glow sometimes visible from the crater. Pavlof (Alaska Peninsula, USA): The Alaska Volcano Observatory concluded that “the most recent period of explosive eruptive activity at Pavlof Volcano has ended” and downgraded the volcano alert level again. “For about the past week, seismicity at the volcano has remained at low levels and shows no indication of the unrest typically associated with lava fountaining or ash emission. Satellite observations show no evidence for continuing eruptive activity. Thermal signals at the summit are occasionally visible, but are likely being generated by the cooling of previously emplaced lava and debris and not newly erupted material.